Join us for our exciting Summer Tour adventure to the DPRK. This is without a doubt our most favourite tour of the year. Bring your swimmers and your towel as we take advantage of the beautiful hot summer season! During our Group A tour we’ll see everything you must see within Pyongyang such as the War Museum, the Mausoleum of the leaders, ride the underground Pyongyang Metro and a day trip down to the DMZ from the North side! We’ll also hit up Pyongyang’s new Water Park to take a dip and ride the slides with the locals to cool off. We’ve organised a special visit to the DPRK International Football Academy where we’ll check out their facilities and play a friendly match against their students. 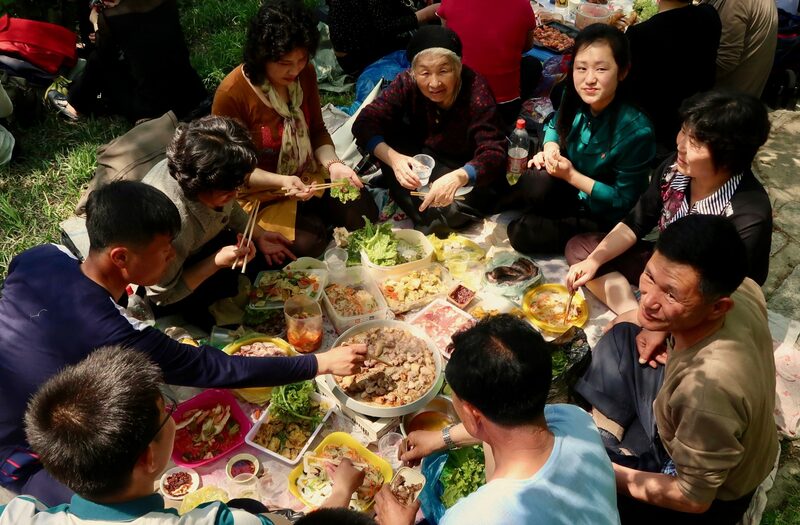 For those who want to explore more this is the perfect time to do an extended tour, our group B tour will be visiting the beautiful city of Nampo and its therapeutic hot spa resort on the west coast, as well as a co-op farm and nearby factories. We’ll then go for fresh dip and hangout with the locals and their families at a nearby beach located near the famous West Sea Barrage. Our Group C tour will take you to the east cost of the Korean peninsular to the gorgeous and very sunny city of Wonsan. This is a very popular holiday destination for Koreans all over the DPRK. Here we’ll try the very delicious and very fresh seafood caught along the pier and to spend a special afternoon kicking a football around, playing frisbee and swimming with the local families. We’ll also have time to explore the newly renovated International Children’s Summer Camp. 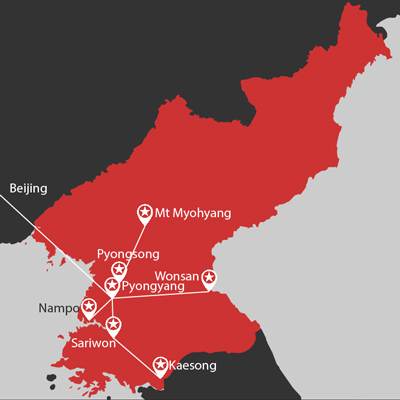 We’ll then head north of Pyongyang to Mt. Myohyang which is most famous for the International Friendship Exhibition. This incredible exhibition is buried deep into the sacred mountain and holds the gifts presented to all three leaders by other governments, corporations, and individuals such as Dennis Rodman and the Globetrotters! Something definitely worth checking out! During Group A of our tour, we’ve been given special access to a Russian Mil Mi-17 helicopter to take for a whirl around Pyongyang city for a unique aerial tour of the capital. So come join us as we hit up another exciting summer in the DPRK and take you around on this amazing tour! Don’t forget your swimmers! Visit Mansudae Grand Monument – the two large bronze statues of President Kim Il Sung and Leader Kim Jong Il overlooking the city. (Optional extra- you can present flowers if you wish: 5 euros per bunch). The Arch of Triumph- The largest Victory Arch on the planet, it celebrates the victory over the Japanese and the return of the general Kim Il Sung to his home city. Workers Party Foundation Monument – built in 1995 to signify the 50th anniversary of the Workers Party of Korea. Visit the Korean Film Studio where we’ll have a chance to dress up in costume and check out the backdrops of fake locations such as Seoul, China, Japan, and even Europe! Kumsusan Palace of the sun- Where President Kim Il Sung and Comrade Kim Jong Il lie in state. 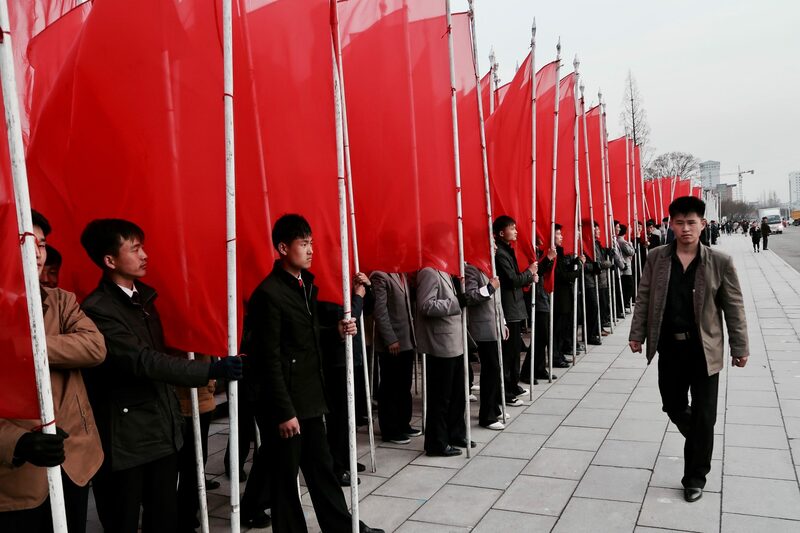 Visit Kim Il Sung Square and walk around the largest square in Pyongyang City. Lunch at Moran Hill Chicken restaurant. 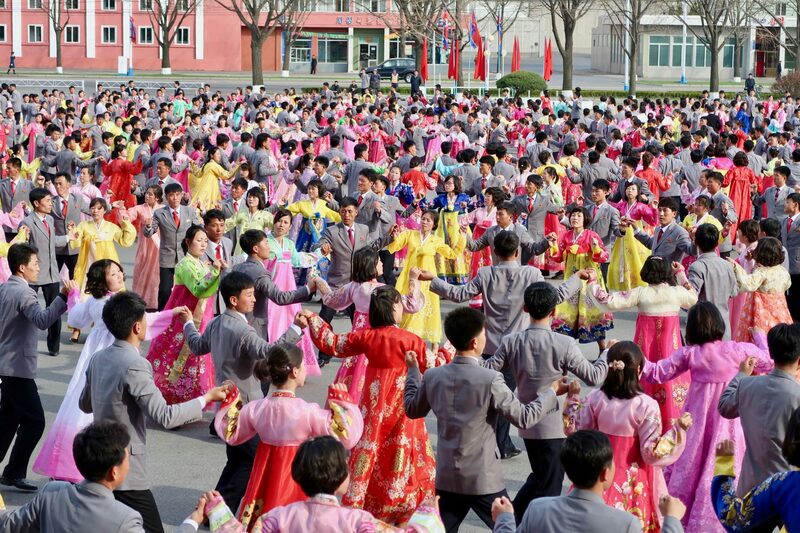 Mangyongdae Schoolchildren’s palace – The largest of the schoolchildren’s palaces (extracurricular centres) in the DPRK, we’ll first observe some lessons then watch the amazing performance. Dinner at KITC Restaurant in Mangyongdae District to try Pyongyang’s famous Cold Noodle Dish or the traditional Korean BiBimBap dish. Tomb of King Kongmin- the only original tomb of it’s kind still standing in the DPRK. 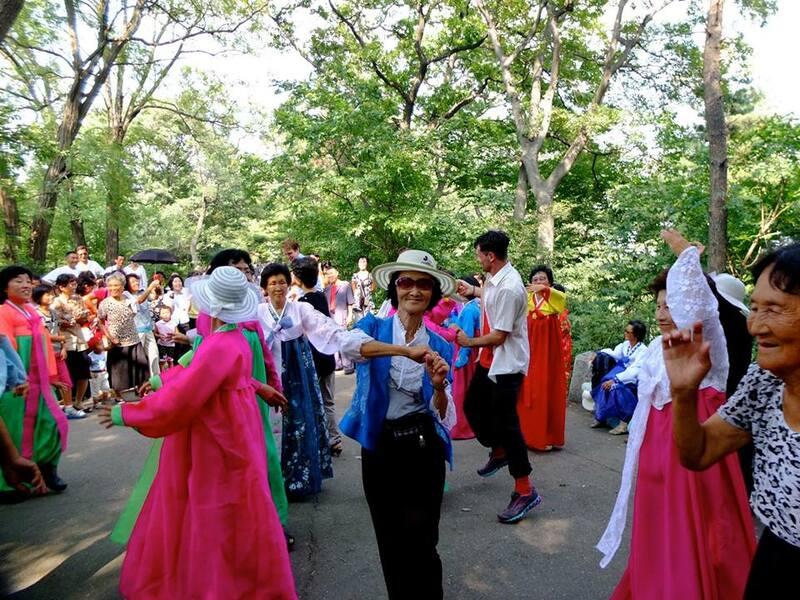 Drop by Sariwon City (Capital of North Hwanghae province) to walk in the local folkcustom park and view the city from the mountaintop pagoda. Visit the local Makkoli bar in Sariwon to try the traditional Korean fermented rice drink (5 rmb a bowl). 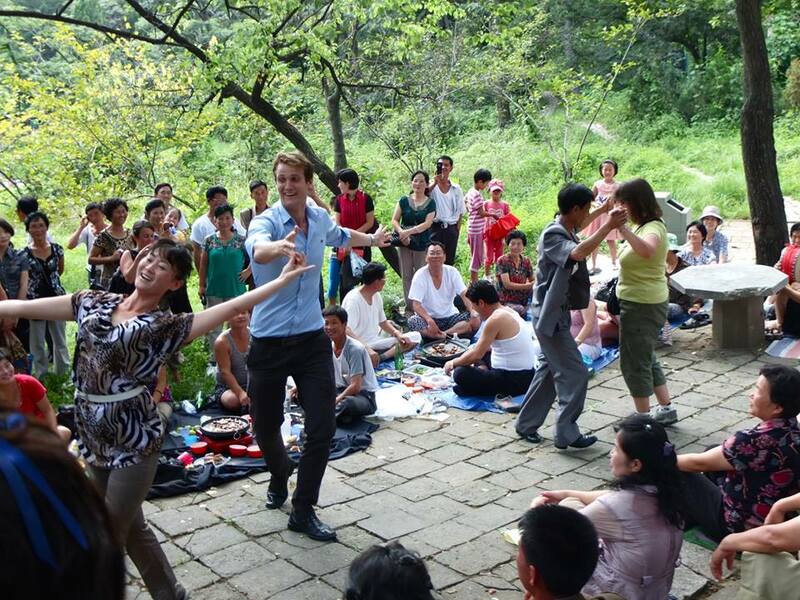 Arrive back into Pyongyang for a farewell dinner at the National restaurant with performance! Group A flight members depart at 8:55am for Beijing on Air Koryo. (Arriving in Beijing at 9:50am Beijing time). Group A train members depart at 10:25am for Beijing on train K28. (Arriving in Beijing Railway Station at 9:00am on Sunday the 18th). West Sea Barrage- An astounding example of socialist construction, the barrage was built to keep the salty water of the West sea from rendering parts of the Taedonggan river and surrounding farmland useless as well as to tame the local sea. 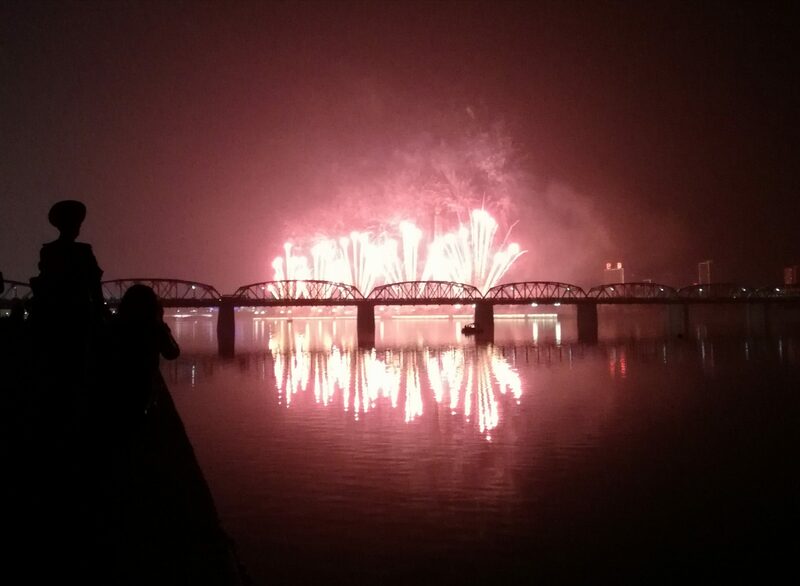 Unique trip highlight – Swim at Nampo beach and hang out with the locals! Dinner and Overnight at the Ryonggang hot spa hotel- with a mineral spa in each room! Great place for billiards and ping pong. Here we have a chance to try Korea’s famous Korean clam BBQ for 5 euros extra. Chongsan Co-operative farm- One of the top co-op farms in the DPRK and a model of the co-op method. Here we’ll be able to explore the village and possibly visit the nursery, a farmers house or even the local theatre. Kangso Mineral water factory- Home to the DPRK’s most famous sparkling water- with samples! Stop by the local department store – here we can buy local made items and use the local DPRK Won currency! Overnight at the Chongnyon Hotel to experience another hotel in Pyongyang! This hotel was built for the World Youth Games back in 1989 and has Pyongyang’s only outdoor swimming pool that tourists can jump into! Group B flight members depart at 9:00am for Beijing on Air Koryo. (Arriving in Beijing at 10:00am Beijing time). Group B train members depart at 10:25am for Beijing on train K28. (Arriving in Beijing Railway Station at 9:00am on Tuesday the 20th). Visit the International Friendship Exhibition – Two large gift houses holding the gifts presented to both Kim Il Sung, Kim Jong Il and Kim Jong Un from people, governments and institutions all over the world. Something not to be missed! Head back to Pyongyang and on the way stopping at Ryongmun cavern – one of the most famous cave structures in Korea, it’s well known for its size and the uniqueness of its rock formations. Group C flight members depart at 10:30am for Beijing on Air Koryo. (Arriving in Beijing at 11:30am Beijing time). Group C train members depart at 10:25am for Beijing on train K28. Experience a slice of local life in the port city of Wonsan, swimming with locals and eating BBQ along the pier.